Hasbro package contents listing Includes; jumpsuit, belt and boat shoes. 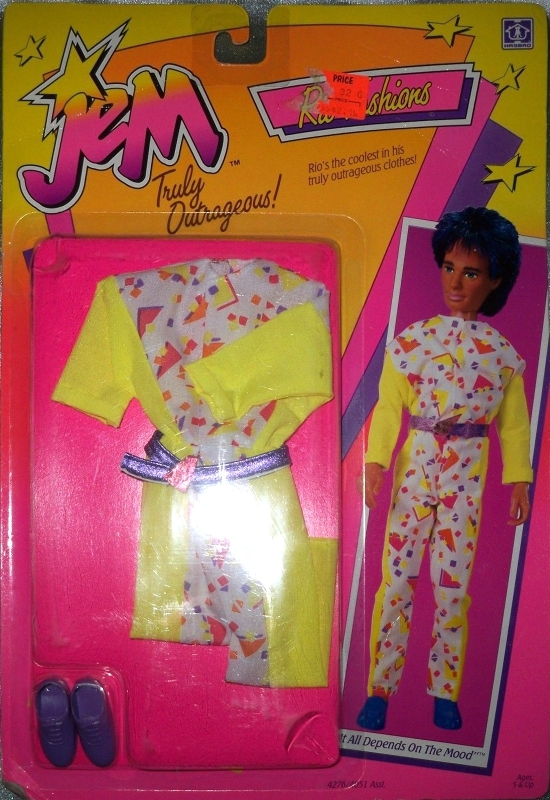 Rio Fashions are among the only Jem items to bear the date of 1987. 1987 Rio fashions did not appear in the French or UK 1987 Hasbro catalogues; presumably they were not available there. One of the easiest Jem fashion to find NRFB. Skip here for a listing of other depictions of It All Depends on the Mood (cartoon, prototypes, catalogues, etc). 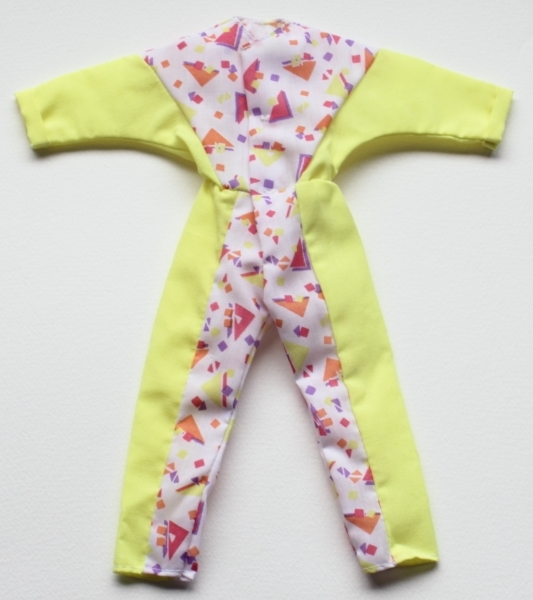 Jumpsuit: Wildly patterned cotton/poly one-piece jumpsuit. This fabric is also shown in the Hasbro Pre-Toy Fair Catalogue Matching Medley Fashions. All I can say is... What kind of mood would you have to be in to wear this? 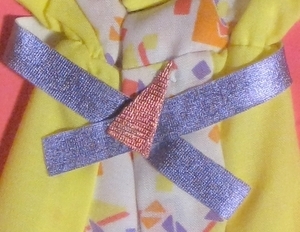 belt: Purple lamé, with velcro closure, dark pink lamé triangular "buckle". boat shoes: dark purple Rio boat shoes with zig-zag pattern on the soles. Packaging Variants: A listing of the packaging that It All Depends on the Mood can be found in, that I know of, so far! Canadian issue 1987 photograph Smashin' Fashions card. US issue 1987 photograph Smashin' Fashions card. © 1987 Hasbro, Inc./Pawtucket, RI 02862/All Rights Reserved./Made in China. H-22. Looks like the produced fashion to me. It seems to be the one without the hemmed edges on the belt. It was featured on the cartoon, see left. 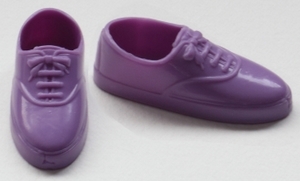 Not sure what colour the shoes are but otherwise looks pretty much like the produced fashion. Credits: Thanks to Glamour to Divaz for letting me photograph Rio doll and loose fashion. Thanks to Matt for the photo of the carded fashion, and information.